History comes alive in Partisan, a dynamic collaboration between Shepard Fairey and Gary Baseman, featuring Ben Baseman – a freedom fighter who fought in the woods of Poland for over three years during World War II. Ben Baseman survived the mass murders that took place in 1941-42 in cities across Eastern Europe, including his hometown of Berezne. After losing his parents and many loved ones, he fought for freedom and miraculously survived. Ben Baseman lived to the age of 93, having raised four children in the Fairfax district of Los Angeles that includes the artist Gary Baseman. The red version of Partisan was released in conjunction with Gary Baseman’s museum exhibition, The Door is Always Open, at theSkirball Cultural Center in April 2013. 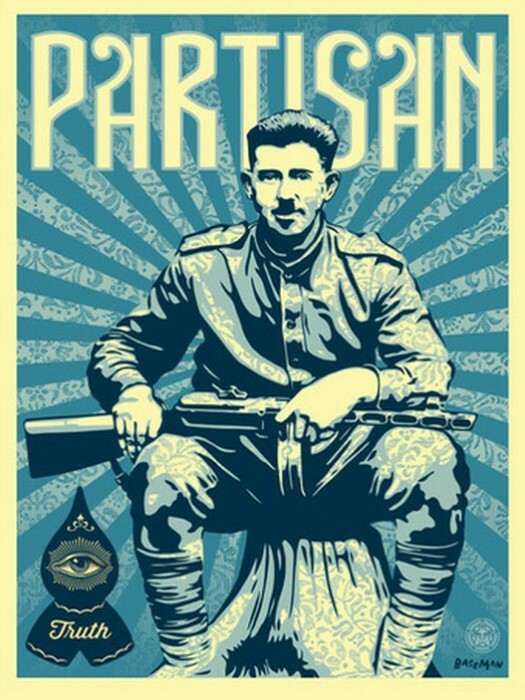 The blue version of Partisan was released in August 2014 as a Kickstarter perk for Baseman’s documentary film Mythical Creatures.